- Part your hair the way you like, then separate a one-inch section of hair at each temple and clip those sections out of the way. - Gather your remaining hair at the nape of your neck. - Then create two or three low braids, securing the ends with clear elastics. - Twist each braid until it curls into itself; bobby-pin in place. - Last, unclip and twist the two pieces by your temples. 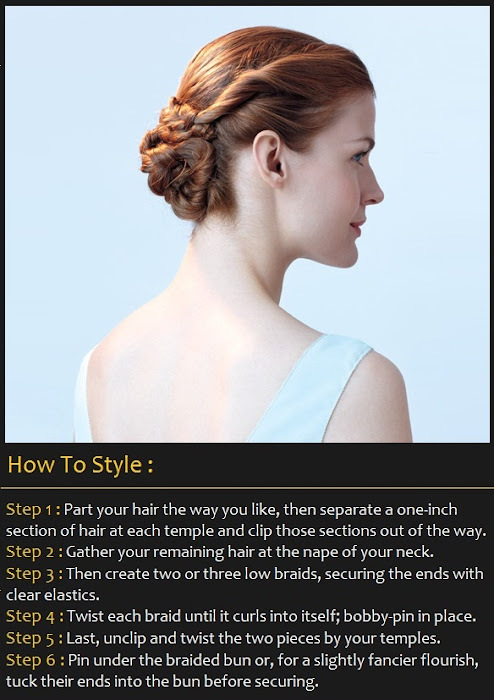 - Pin under the braided bun or, for a slightly fancier flourish, tuck their ends into the bun before securing.